I adore this Christmas card, so much so, I want to be given one for Christmas. But it’s not the same if I have to make my own card! I decided to use the layout for Bella, and make a similar design but with a more festive feel. So with that in mind I opted for a more traditional Christmas colour scheme of red, white and gold with the feature being roses. I decided the materials I wanted to use should include a mix of different textured ribbons, such as sheer, satin, and lame, pearlescent board, beads, and lots of wire detail in the form of spirals and curls and of course the addition of quality diamante buckles and Swarovski crystals. This is probably the most luxurious card I’ve made in terms of the materials used. 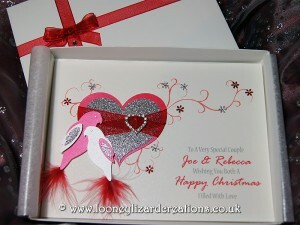 But doesn’t it look fabulous, definitely a really special card for someone very special. Since the release of my design Duet I have received quite of few requests for this design to be made in lots of custom colours. I thought it would be the perfect design to turn into a seasonal Christmas card for a special couple as I think the two love birds symbolise this perfectly and wanted to bring a design to the range that could be chosen for all those special daughters or sons and their partners. Again I decided on the traditional red with the addition of silver and white as the colour scheme, and changed the tiny flowers on the original duet design to tiny snowflakes in silver and red glitter. Giving this beautiful design a lovely festive feel. For Stardust I wanted to create a luxury Christmas card design specifically for men. So I decided to go for a striking and bold colour scheme of festive gold and sparkling black. The outline of the design is similar to my design White Christmas, but instead of snowflakes I’ve used a series of stars in different sizes. The stars have been composed to suggest a starburst with the larger star being decorated with lines of Swarovski crystals running from star point to star point to create a feeling of outward motion. This card really shimmers and sparkles but is still masculine enough for your man. However, if you would prefer something that doesn’t contain the colour black. So folks that it’s for the handmade luxury Christmas cards for 2013 and I do hope you enjoy the new handmade christmas card designs as much as I did creating them. As always I would love to hear your thoughts so please do leave a comment.